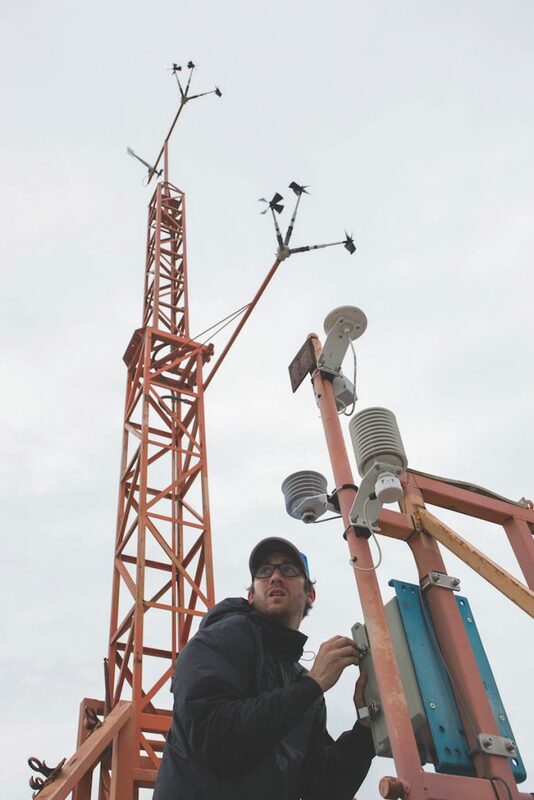 As the University of Florida shuttered offices in advance of Hurricane Irma, wind engineer and hurricane researcher Forrest Masters and his team readied a convoy of equipment, fueled up and headed into the storm. 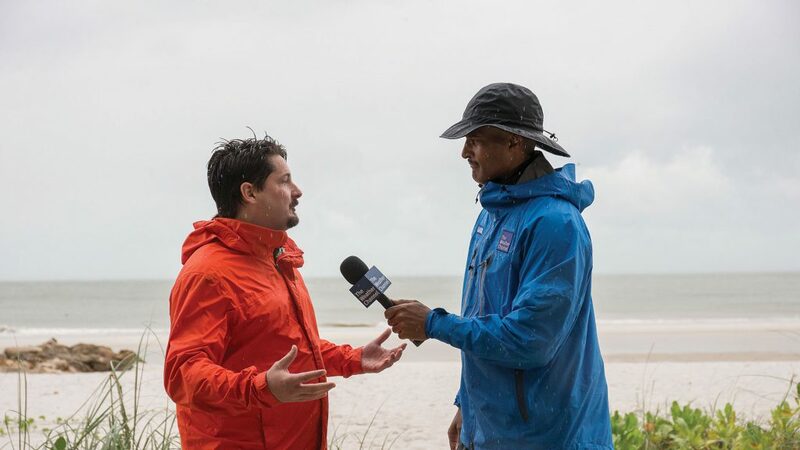 Viewers glued to The Weather Channel for coverage of Hurricane Irma saw a live shot of the team as it set up one of four weather stations in Southwest Florida. Two 49-foot towers with instruments every eight feet were set up in Naples. Two 33-foot towers went to Bonita Springs and Punta Gorda. Once set up, the team evacuated. In the case of Irma, that meant returning to Gainesville to secure their own homes. But during Hurricane Harvey, they set up as close to the path as possible in Rockport and Port Lavaca, Texas, then holed up in a nearby airport. The shorter towers are designed to withstand wind speeds of more than 200 miles per hour. While they might measure stronger winds closer to shore, Sinnreich says a big consideration in location is being able to retrieve the towers after the storm. If a beach erodes, expensive equipment and data could wash away. Masters, a civil engineering professor and associate dean for research and facilities in the Herbert Wertheim College of Engineering, had his eye on Irma as it formed off Cape Verde. Data from Harvey and Irma are being analyzed and added to a database that includes 30 named storms. Using the database, researchers can improve the understanding of wind field behavior around buildings and infrastructure. Irma’s size, 400 miles across, made it a statewide threat. UF’s Institute of Food and Agricultural Sciences conducts research throughout the state and operates Cooperative Extension Offices in all 67 counties. Those employees sprang into action to protect research and aid their communities. At the Tropical Research and Education Center in Homestead, mechanic Jorge Vergels protected years’ worth of experiments when the power went out. Vergels pushed through 70- to 80-mph winds when the generator failed, got instructions by telephone for fixing it, and managed to get it running. His quick response preserved research samples collected over many years and saved hundreds of thousands of dollars. Researcher Wagner Vendrame echoed the sentiments of his colleagues at the research center when he noted that his lab alone contains refrigerators full of reagents and chemicals, incubators and a bioreactor, and a -70 degrees Celsius freezer that stores DNA and RNA samples that would have been rendered useless if thawed. “In some instances, loss of research material would have been irreversible and seriously compromise an entire research project,” Vendrame says. Groves, fields and greenhouses were less fortunate. UF/IFAS Dean of Extension Nick Place says citrus production losses amount to 50 to 90 percent, with similar losses in vegetables and ornamental crops in some locations. Communities that rely on fishing and shellfish have lost boats, and in the Florida Keys, about 450,000 lobster traps were damaged or lost. Those same crops are also the subjects of UF/IFAS research, and damages could be in the millions when a final tally is reached. Extension agents pitched in after the storm, with Putnam/Flagler County Extension Director Sharon Treen keeping emergency responders fed, and Okeechobee County dairy agent Colleen Larson cooking and delivering food to dairy workers, so they could tend to thousands of cows. UF students formed a blueberry brigade with the help of horticulture sciences department Chair Kevin Folta, who led them into fields in Pasco County to restake 100,000 blueberry bushes flattened by the storm to keep them from dying. And in advance of the storm, students who had been collecting data on citrus greening rushed out to finish experiments on citrus trees, anticipating the post-storm damage to the research stock from flooding and fruit drop. Place says Irma shows the value of science-based information in a crisis. Not all evacuees were human. Throughout the state, the UF Veterinary Emergency Treatment Service went to work, providing crates for pet-friendly shelters and assessing animals, like horses and livestock, that had to shelter in place. The team also deployed to the Florida Keys to provide emergency veterinary care for animals that were not evacuated. The Keys’ direct hit also affected a research project to restore populations of the critically endangered Miami Blue butterfly. Florida Museum of Natural History Assistant Curator of Lepidoptera Jaret Daniels, who has studied the Miami Blue for more than a decade, has a captive research population at the museum, but the wild population is only found on a handful of uninhabited islands and in the Great White Heron National Wildlife Refuge, which were in the path of the storm. Daniels says it will take several weeks to determine how many survived, if any. The good news is that the museum’s captive population can be used to help in recovery, Daniels says. Daniels says he is cautiously optimistic about the fate of the Schaus’ Swallowtail farther up the Keys in North Key Largo and Biscayne National Park, although the Schaus’ Swallowtail and the Miami Blue have lost enough habitat that a hurricane could be a tipping point, Daniels says. 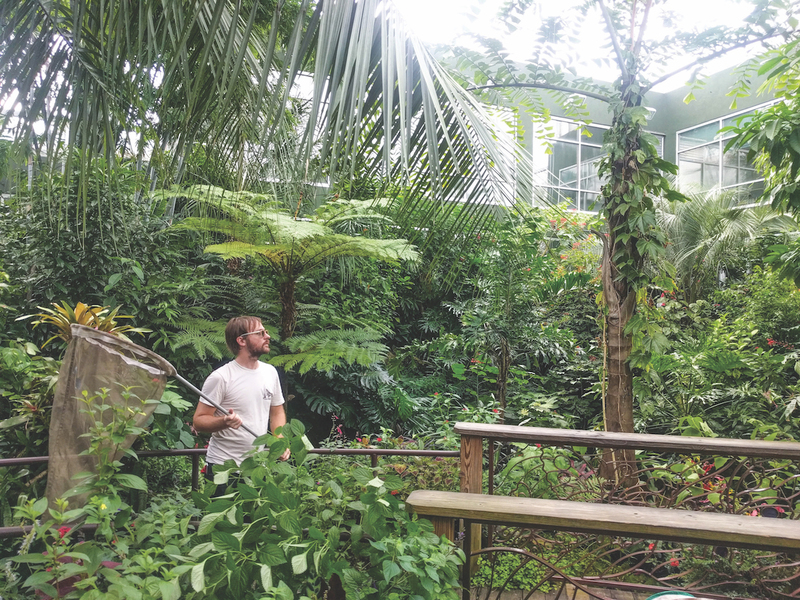 In the museum’s Butterfly Rainforest, a 6,400-square-foot screened exhibit, the 1,000 or so captive butterflies and moths were evacuated prior to the storm by employees with butterfly nets, who placed them in flight cages inside laboratories for the duration of Irma. Some of the species on exhibit are non-native, so the museum must guard against their accidental release. The museum also had sandbags around the Montbrook fossil dig south of Gainesville to preserve the excavation site, which is the first evidence in North Florida of fossils from the late Hemphillian land mammal age, about 5 million years ago. When they inspected after the storm, they found the site intact except for some minor erosion that yielded a bonus: plenty of bones of elephants, turtles and other extinct creatures sticking out of the side of the pit. All the better, says museum paleontologist Jonathan Bloch, since the museum is ready to start recruiting volunteers for the fall 2017 dig season. Jack Payne, senior vice president for agriculture and natural resources, notes that UF was named a top 10 public university during the storm.